Dexter Daily: Dexter Will Be at Comic-Con 2012! Dexter Will Be at Comic-Con 2012! 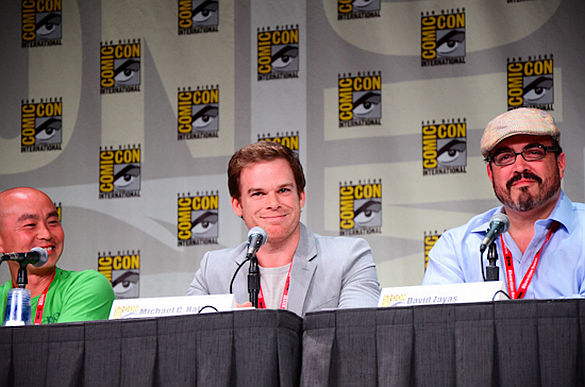 Showtime is about to announce that 'Dexter' along with other TV Shows will be at Comic-Con 2012. Comic-Con 2012 will take place almost 10 days earlier than last year. Thursday July 12 to 15. (Preview night: July 11). Info about the Dexter panel soon. That means the trailer will come out earlier too right? They probably won't show much though since there was a cliffhanger. Deb saw Dex killing someone, she will figure out it wasn't his first kill, she won't tell anyone, she won't arrest him, she won't kill him. btw: The Season 6 Comic-Con trailer didn't spoil anything (unlike the "guest star" trailer which basically spoiled the entire first half of the season). "What cliffhanger?" Haha the one we've been waiting for for six seasons. That one. This stuff usually gets released on youtube right?